There's something delicious about the graphic quality of the covers designed for Penguin paperbacks during the 1960's. They are renowned for their dark, suggestive images and remain very popular under Penguin Collectors. The cover layout of this period was designed by Romek Marber and introduced in 1962. The Marber Grid uses different weights of the Intertype Standard typeface, which is a version of Berthold's lovely and rounded Akzidenz Grotesk. This layout allows a lot of room for an illustrative element, compared to Penguin covers from the 1950's. 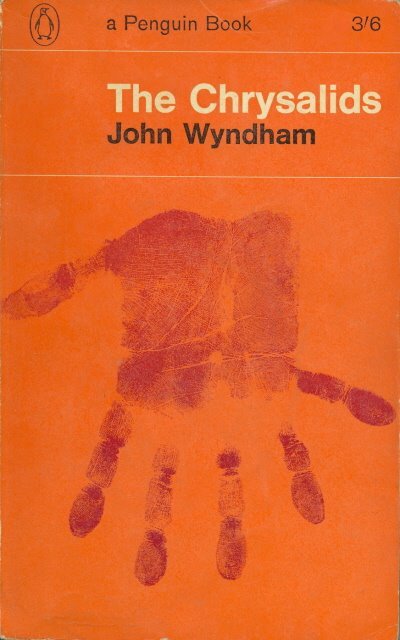 My favourite among the Marber Grid covers, and probably my favourite cover design of all time, is for The Chrysalids, by John Wyndham. My copy is a 1965 reprint inherited from my mother and is one of the only books she ever wrote her name in. It therefore holds a certain amount of sentimental value for me. For the anoraks out there, it's Penguin no. 1308 (this was in the decades before ISBN numbers were implemented by the company). The cover illustration is by John Griffiths and features a simple hand print the colour of dried blood. Simple, elegant, beautiful. "When I did succeed in getting the foot free, it looked queer: I mean, it was all twisted and puffy - I didn't even notice then that it had more than the usual number of toes...."
The Chrysalids, written in 1955, is a great example of 1950's post-apocalyptic science fiction. It brings together all of our fears about nuclear disaster and the harsh realities of DNA: mutation, religious extremism, sterilization, wastelands, human suffering, eugenics, exile, the wrath of God, evolution. The characters in the book have to survive in a barren world hundreds of years after some nuclear holocaust. They uphold the belief that Man is created in God's image and that any deviation from the image is a mockery of that sacred bond. When a mother gives birth to a mutant child, the very act of giving it life is blasphemy. "The enemies of God besiege us. They seek to strike at Him through us. Unendingly they work to distort the true image; through our weaker vessels they attempt to defile the race. You have sinned, woman, search your heart, and you will know that you have sinned." Mutant crops are burned. Mutant livestock is slaughtered. But the true fear of the ignorant is that Deviation might manifest itself in themselves. Therefore extra digits are amputated, mutant newborns are hidden from the authorities... or killed. But the abominations and edge dwellers do not take abuse lying down and the story really takes off when a group of supposedly normal children discover their ability to communicate telepathically with one another and then start to seek out others of their kind. "One of the hands which held a bow had six fingers; one man displayed a head like a polished brown egg, without a hair on it, or on his face; another had immensely large feet and hands; but whatever was wrong with the rest was hidden under their rags." Yet the way of life on this planet has always decreed that new species supercede the old. The 'normal' people are unwilling to accept this change, which is what makes them obsolete. In the wasteland of the future, adaptedness has been sacrificed for adaptibility. A new central dogma of biology. Out of the chrysalis of our former selves, our new improved design will emerge. It is inevitable. "The living form defies evolution at its peril; if it does not adapt, it will be broken. The idea of completed man is the supreme vanity: the finished image is a sacrilegous myth." It pretty scary that what he wrote so long ago is still so applicable! Was his other book that bad? Have not read it but everyone always raves about it! Ek glo nie dit sal enige tyd binnekort gebeur nie - miskien as ek cool tabs vir die blog kry soos wat Karen het... maar dis meer moeite as waarvoor ek op dié stadium tyd het. Triffids is more famous because a very schlocky B-movie was made out of it. It also had a very unlikely premise. Basically the whole world is blinded after looking at a meteor shower, whereafter giant carnivorous - yet agronomically important - plants stalk the planet. It has faintly ridiculous moments (such as people rolling stolen wheels of cheese out of an abandoned shop) and ridiculous plot devices (such as every sighted male having to impregnate two blind females in order to repopulate the earth). and to think - it is said that books should not be judged by their covers..
in this case, i take it all would be forgiven if one did..
Book covers are pretty much used to lure the quick decision buyers: customers at airport bookshops, hysterical people being whipped into a frenzy at a winter sale, etc. However, I think that in the 21st century, more than ever, you can judge a book by its cover: chick-lit all looks the same, crime fiction all looks the same, literary stuff all looks the same, comic fiction all looks the same. Yes, it's true that not all books in a particular genre are created equal, but the quality of the cover design will reflect the amount of attention the editors have given that title, and the anticipation of the publisher in it being well-received. Bodice-ripping, torso-bulging romance novels you buy for R25,00 at the supermarket checkout are not produced to the same standard as a well-written, reflective Paul Auster novel, and this is reflected in the cover aesthetics. i prefer to choose my books based on author. or, the urgings of close friends who have similar reading appetites..
i am yet to be disappointed.